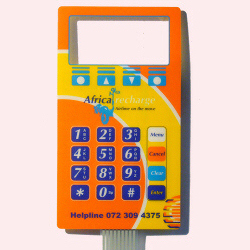 In its simplest form a membrane keypad consists of one or several keys within a flat panel (less than 1mm thick). 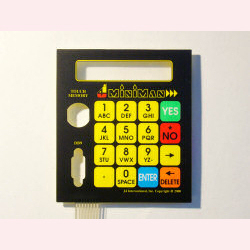 Each key consists of an open contact between two tracks or wires that exit at the back of the panel in the form of a tail that can then be connected directly to a PCB (Printed Circuit Board). 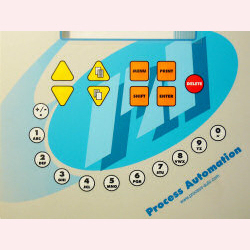 Each key is graphically represented on the top panel and to operate all that is required is a simple press of a finger on the designated key to momentarily short the contact. 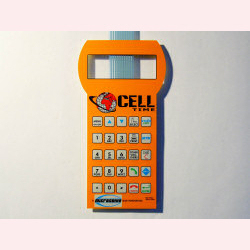 Membrane keypad technology was developed over 20 years ago. It has proven to be simple, reliable, economical and above all attractive both in design and function. 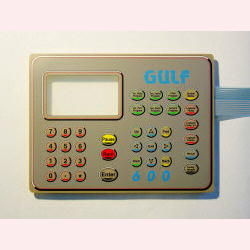 It is the design capability that has let the membrane keypad stay fresh and modern into the 21st century. Here, at Electronic Touch Systems (ETS), we take pride in being able to offer you a reliable working product with the latest hi-tech looks. No two keypads need to look the same. The graphic or top layer has many possibilities. Because the raw material is clear and all the colours are printed individually it is possible to leave clear areas in the graphic that can create any shape of window for displays or LED ports. Colour combinations are endless but remember colours are individually printed resulting in a cost implication. Typically a basic unit starts with two colours, one colour for the detail and the second colour for the background. Colours normally vary from two colours to five colours but there is no limit. Solid colours are preferred as half-tone printing is limited and can lead to extra expense. The printing process is currently restricted in this way but digitally printed graphics with full colour resolution may soon be possible. For colour references we use the universal Pantone colour chart as a guide to the finished product. The circuit assembly consists of two layers, an upper circuit and a lower circuit, separated by a spacer material. The keys only make contact when the upper circuit is pressed down onto the lower circuit. Both circuits are joined at a single connector on the end of the tail. Unlike PCB boards the tracks are printed with conductive ink onto a clear polyester film. This allows many options but also limitations on spacing of keys and circuit layout e.g. 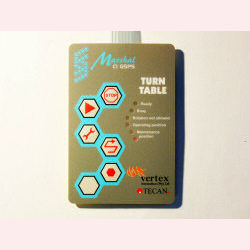 a membrane switch with up to 7 keys can have a single common track on one layer and then 7 more tracks, one to each key on the other layer resulting in a tail with 8 tracks leading off the membrane keypad. Where more keys are required for example a 12 key membrane it is preferable to use a X Y matrix configuration. In other words one layer will have 3 tracks for the columns and the other layer will have 4 tracks for the rows resulting in a 3 x 4 matrix and 7-track tail. In this situation your microprocessor will interpret which key has been activated and the resulting response processed. The tail is what connects the keypad to your interface or processor. 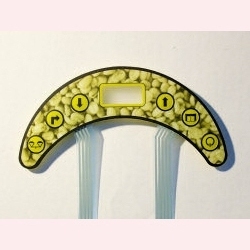 The tail can be manufactured to any length, normally 50mm to 200mm and have various connection options. Most popular is the female type with housing at 2.54mm pitch and is suited to plug into a standard header on a PCB. Male solder tabs are also available to directly solder into a predrilled board. There are several PCB mount type connectors where the tail end can push fit into a connector already mounted on the PCB. 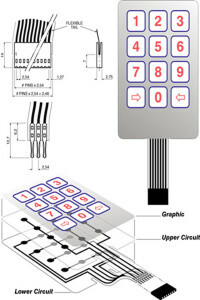 Some of these PCB connectors offer a 1mm pitch for tight spaces and this would result in a narrower width of the keypad tail. 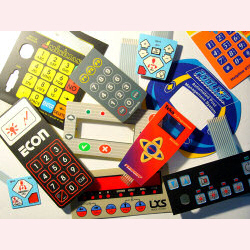 Standard construction of the membrane keypad offers no tactile feedback but an audio or visual display can satisfy most users. Where a physical feedback is required tactile keys are an extra feature. 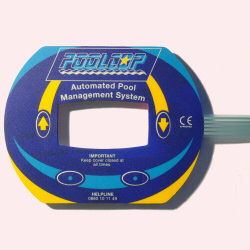 These consist of metal clickers incorporated inside the membrane assembly that offer a positive click when pressed. It is possible to raise certain areas of the graphic to create either ridges around the keys or the whole key itself. The process is mostly cosmetic but is very popular and the results pleasing to the eye. An extra layer, either solid or in a grid pattern, can be incorporated between the graphic and the upper circuit. This layer facilitates the cancellation or dissipation of electrostatic build up on a person’s finger. Electrostatic discharge can interfere with or damage sensitive electronic components. RFI shielding used on non conducting composite casing materials to shield sensitive electronic devices from radio frequency electromagnetic interference. Surface mounted LED’s can be located inside the membrane keypad either with their own circuit and tail or incorporated with the key circuit layer and become part of the single circuit layout. Normally the graphic is embossed over the LED with the option of printed transparent colours to enhance the look of the LED on the graphic. Back-lighting is often desirable but past technology has been expensive and the results disappointing. Electronic Touch Systems (ETS) is currently testing new products and would welcome your requirements and participation. Our experience with printing and materials allows us to offer many other products. 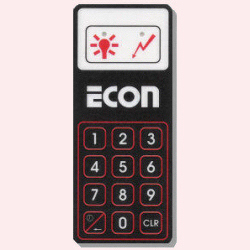 All manufactured to the same specifications and dedication as our membrane switches, offering the same benefits and design flexibility. Volume consistency and service are the requirements and here you will find no better supplier. You have admired them; so why not let us show you how easy it is to acquire. Simple process but amazing results. Put a lens over your image. All products and individually tested and inspected. We are an award winning team, both locally and internationally. All products are monitored and documented during every stage of production. We strive to meet your requirements.